In October, with support from the Kenan Institute for Ethics, I attended the annual conference of the North American Victorian Studies Association (NAVSA) to present research I completed last year as a Kenan Graduate Fellow in Ethics. This conference represents the largest annual gathering of interdisciplinary scholars working on mid-to-late-nineteenth-century British literature and culture. In addition to enjoying brilliant panels and plenary talks, consulting with a former advisor, and networking with colleagues, I presented a paper to my fellow Victorianists and gathered valuable feedback for use in revising my first dissertation chapter. My research contests political liberalism’s conventional presumption that a social system organized around contractual relationships among individuals ensures the self-sovereignty of its members. According to an influential nineteenth-century narrative of political progress, societies evolve from a foundation in status-based, group relations to a system based on freely-willed agreements between individuals. This understanding of progress privileges a particular kind of political subject, the “liberal individual,” who is said to exercise rational decision-making procedures to form consensual agreements with others. I argue that while Victorian political theory was conceiving and disseminating this narrative, the Victorian novel was revealing the concept of the liberal individual’s autonomous consent to be a powerful political fiction. In our contemporary society, we remain Victorian in our reliance on a model of individual consent as the underlying justification for our political system; my interest in the Victorian novel thus lies in its ability to reimagine and critique the political conditions that we take for granted today. My experience as a Kenan Graduate Fellow introduced me to the wider community of Duke graduate students working on the same ethical issues that my dissertation seeks to address, in disciplinary fields only apparently far-removed from literary studies. I met economists, public policy scholars, political scientists, theologians, historians, sociologists, and philosophers, all working from different perspectives on aspects of the ethical implications of constructing our democratic institutions around the concept of the agential rational actor. Learning about my peers’ research on seemingly far-flung issues—abortion rights in Ireland, the psychology of climate change, the interaction of self-help rhetoric and perceptions of inequality, among many others—revealed to me how interconnected our research actually was. By engaging in interdisciplinary dialogue that put into conversation the expertise and perspectives of a diverse set of scholars, I was able to better articulate what I research and why it matters. My experience as a Kenan Graduate Fellow enabled me to contextualize my own work in a wider set of issues while introducing me to a group of smart, engaged, fascinating people with whom I continue to collaborate. The continuing support of KIE made it possible for me to share these insights with my fellow Victorianists at the 2018 NAVSA Conference. 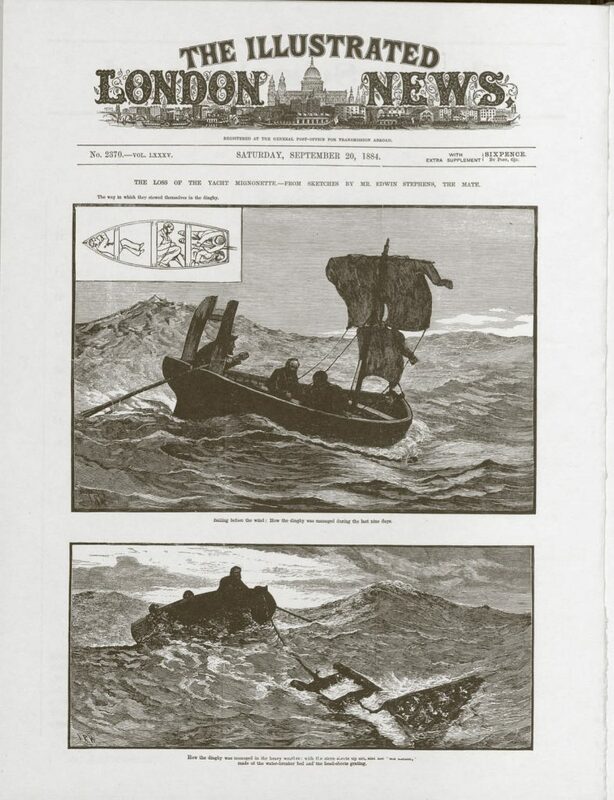 My conference paper, entitled “Contractual Cannibalism in Great Expectations,” discussed an 1884 incident of cannibalism amongst the survivors of the wrecked yacht Mignonette. The “case of the Mignonette,” as it was popularly referred to at the time, caused a sensational public response, much of which centered on the (legally irrelevant) question of whether the men should be held accountable for their failure to observe the “custom of the sea.” This norm sanctioned cannibalism by starving castaways, but also loosely prescribed that the appropriate procedure to follow in determining a victim was to draw lots. The centrality of lot-drawing to the popular understanding of the distinction between licensed survival and illegitimate brutality, I argue, places consent at the center of the determination of who eats whom, rendering an agreement to draw lots a kind of contractual cannibalism. Lotteries make survival cannibalism legible to liberalism by transforming an act performed under extreme duress into the natural consequence of an agreement entered into by willing individuals. I contend that it is the durability of this liberal fiction of consent that the Mignonette Court was invested in maintaining when it found the survivors guilty of murder. I further argue that more than twenty years before the sinking of the Mignonette, Dickens had anticipated and theorized in Great Expectations (1861) the issues that the law would soon be forced to confront. I contend that in Great Expectations, Dickens employs an association between cannibalism and shipwreck to allude to the era’s preoccupation with castaway criminality and the problems of consent it raises. Through this historical referent, Dickens suggests that the violent process of individuation that protagonist Pip willingly undergoes in becoming a modern liberal subject resembles a species of self-cannibalism. Pip’s attempts to distinguish himself from the “coarse and common” mass—to exercise individual autonomy under conditions of constraint in order to enter a larger modern civil society—have the outcome of destroying Pip’s agency, apparently by his own consent. In a liberal society, implies Dickens, the act of agreeing to a social contract is an exercise in self-cannibalism, a violence committed against the individual by that same individual. This contractual mechanism resides at the core of civil society in the cases of shipwreck castaways and ordinary citizens alike. My experiences as a Graduate Fellow in the richly interdisciplinary environment of the Kenan Institute helped me conceptualize how the historical phenomenon of survival cannibalism, the theoretical concept of the social contract, and a literary representation of individual development and social collectivity were in conversation with one another. I’m grateful to my colleagues for their discerning feedback, their ingenious insights, and their lively engagement with the ethical issues that matter in our world today. Emma Davenport is a fifth-year PhD student in the English Department.